The multi-faceted cooperation between Viet Nam and the Czech Republic will be broader in the years ahead with the efforts of both countries, agreed Vietnamese leaders and Czech President Vaclav Klaus in Ha Noi yesterday. 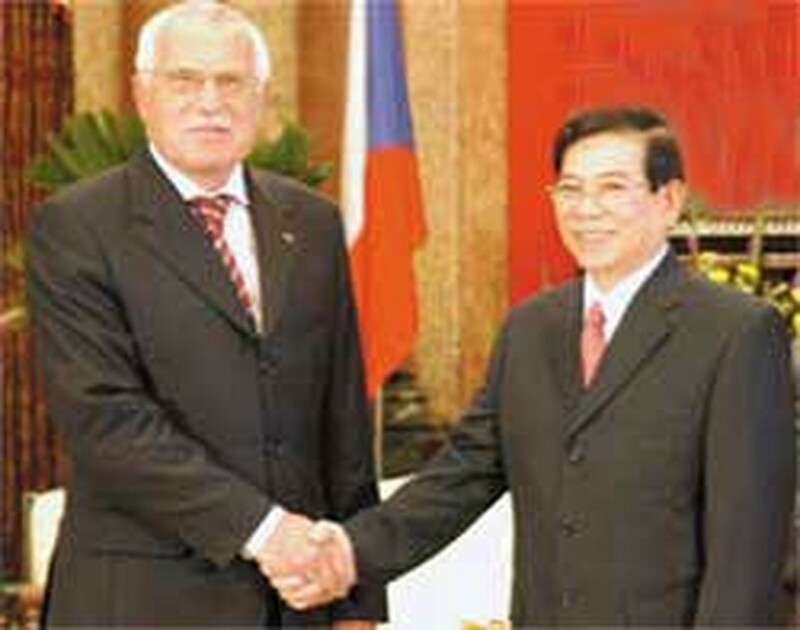 After the welcoming ceremony, President Nguyen Minh Triet had a meeting with the Czech President. President Triet said that while actively joining the globalization process and integrating into the regional and world cooperation mechanism, Viet Nam always attached much importance to consolidating and strengthening multilateral cooperation and friendship with traditional friends like the Czech Republic. President Klaus said that his visit aimed to strengthen economic relations to correspond with the political ties between the two countries. The leaders agreed that the two countries would expand their collaboration in sectors including industry, energy, agriculture, rural development and the environment. The two sides also agreed to strengthen their exchanges in trade and investment as well as establish direct relations between enterprises and organizations of the two countries. In order to boost trade, President Triet suggested the Czech Republic import more of Viet Nam’s agricultural products, food and clothing. In return, President Klaus expected Viet Nam to import more machinery, equipment, glass and medicine from his country. After the official talks, the two presidents witnessed the signing of five important trade and cooperation agreements by the two countries’ relevant agencies. The five signed accords included a memorandum of understanding (MoU) on cooperation between the Vietnamese Ministry of Planning and Investment and the Czech Ministry for Foreign Affairs; a contract to finance the Phu Son cement plant project in Ninh Binh Province and an MoU between the Bank for Investment and Development of Viet Nam and the Czech Export Bank, covering investment to support seven projects in energy, construction materials and food processing technology. The other three were an MoU between Electricity of Viet Nam Corporation and the Czech Export Bank, covering financial support for the Tra Vinh coal-fuelled power plant in the Mekong Delta province of Soc Trang; an MoU on transferring technology to produce beer and other drinks, signed between the Viet Nam Shipbuilding Industry Group and the Czech ZVUPOTEZ Company; and an MoU between the Viet Nam Construction Investment and Import-Export Corporation and the Czech Investicni Lofidami Group, on investment cooperation to build a trade center and up-marked apartment block in Bruno and a tradel center in Praha in the Czech Republic. In a separate meeting with General Secretary Nong Duc Manh, President Klaus said the Czech Republic’s policy attached much importance to strengthening its ties with traditional friends; especially, the Czech Republic considered Viet Nam a priority partner in Southeast Asia. 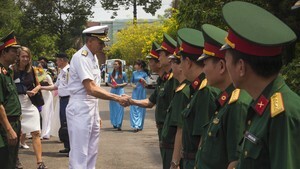 The Czech Republic supports Viet Nam’s standing for election to membership of the UN Security Council. General Secretary Manh told President Klaus about Viet Nam’s socio-economic situation in the past and results of the 10th National Congress of the Communist Party of Viet Nam. Mr. Manh said that he was happy to see the growing cooperation between the two countries and believed the two peoples would work together on development to benefit them both. At the Government Office, Prime Minister Nguyen Tan Dzung had a meeting with President Klaus saying that the countries’ existing cooperation did not yet reflect their full potential and capabilities as two-way trade between the two countries had reached only US$100 million per year in recent years. President Klaus said his country expected to develop irrigation systems, produce cement and cooperate with Viet Nam in culture and education and Viet Nam was one of the eight countries that would receive ODA from the Czech Republic. The PM hoped that after this visit the countries would soon implement newly signed agreements to boost their trade and investment relations. National Assembly Chairman Nguyen Phu Trong also had a meeting to seek further cooperation in legislation. NA Chairman Trong said experience in this area would be useful for Viet Nam. About 40,000 Vietnamese people live in the Czech Republic. President Klaus said the Czech Government would continue to create favorable conditions for them to work and live in the country and highlighted this as a bridge for boosting bilateral trade between the two nations. NA Chairman Trong took the opportunity to thank the Czech people for their valuable support for the Vietnamese in the past and present, especially for those Vietnamese who are living in or who have close ties with the Czech Republic. He affirmed that the Vietnam National Assembly would make regulations aiming to attract foreign investors. Leaders agreed that Viet Nam and the Czech Republic still had more capabilities and potentials to develop a comprehensive relationship.